Distractions and 40k are a Real Pa… ooh, new box set! Was ‘claw’ the one thing left that they hadn’t added to ‘thunder’ or ‘storm’ yet? 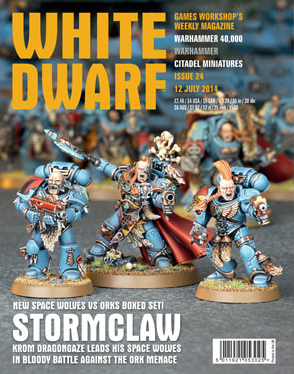 Stormclaw, A new Space Wolves vs Orks box set is heading our way in the form of a limited edition delight full of exclusive sculpts (presumably) from GW. Rumour has it that we could be seeing a couple of these every year as GW looks to expand on existing fluff, forge new narratives and, naturally, make some more money. It isn’t the point of this article, but I’ll briefly give my two cents on the rumoured new box set schedule here – I think it’s a good idea. GW are always going to be looking for ways to make more money – they are a business after all – and I have no issue with them doing it in this manner. What’s more, if it helps to enrich and enliven the setting, and gets new people into the hobby by providing an easy access box, then that’s great. More power to them. 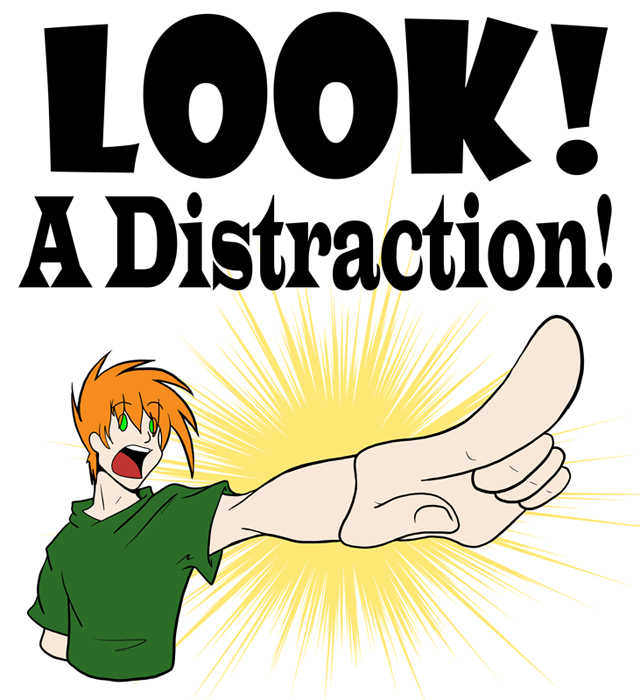 The point of today’s diatribe, this most unranting of rant-ettes, is that it’s another distraction for me and I have enough of those already. 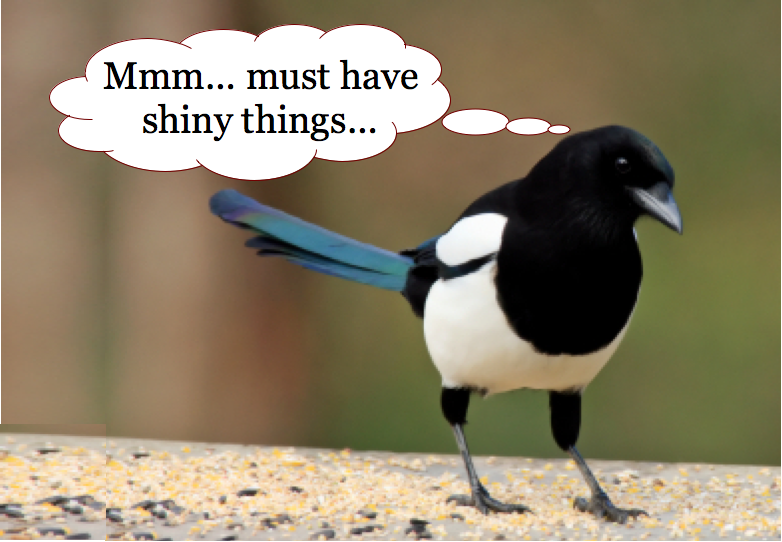 I’ll admit right now that I have shiny-thing magpie syndrome when it comes to the hobby, and I wonder if a lot of other people suffer from the same issue. Depending on your point of view (and it isn’t really mine) there are a lot of reasons to be annoyed with GW. Money is pretty much the cause of most of them and though I concede that this isn’t the cheapest of hobbies, it doesn’t bug me as much as it seems to many others. I budget, I don’t go overboard (well, usually I don’t) and I’ve never seen someone win purely because they could afford to spend more on their army than their opponent. Just my personal experience I’m going off there, but I think the points system, sportsmanship and a few other factors balance things out (no, I’m not talking about that balance – I’m not going near that debate, at least not today) in my meta at least. However, I digress. My issue, is that I want it all. Games Workshop don’t really do marketing. They don’t have press ads, billboards, online campaigns… any of that sort of thing. What they do have though are lovely pictures and the knowledge that, either through visiting their website, popping into a store or flicking through White Dwarf, suckers like me are going to be dribbling over the newest toy soldiers. Now, I have my set factions, even if I have a few of them. Eldar, Grey Knights, Space Marines and Chaos (Slaanesh or Nurgle) and I don’t really stray from these paths. That doesn’t stop me from staring at things like the recently released Flash Gits and really wanting to buy a set and paint them. And why shouldn’t I do just that? 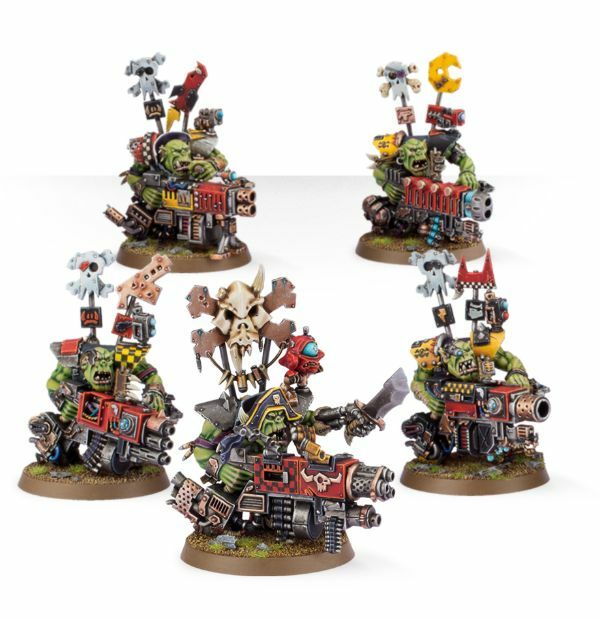 I’ve heard nothing but good things about that kit – lots of options, plenty of fun things and a few funny things too (exactly right for orks). The problem is though, where do I fit it in? My Mortifactors project is still going, though I’ve not worked on those for a while now what with moving house, commission work and the start of my Knight project. Oh yeah, the Knight which has been rekindling my allegiance to Slaanesh over the last couple of days and has me thinking about working on those guys again – a small unbound warband of daemons and marines, perhaps? When does it end?! Well, in my experience, it doesn’t. 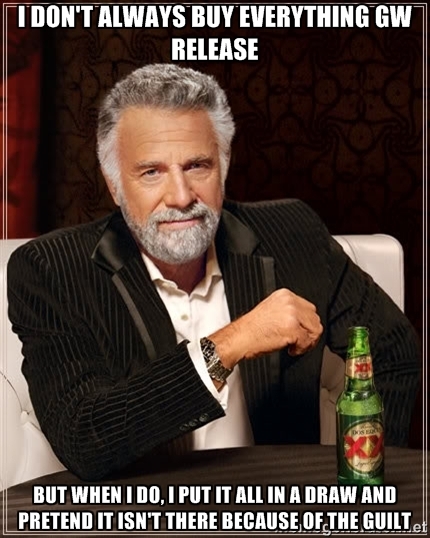 I think I’ve noted in one of these articles before that staff members in my local FLGS have stated that they have been suffering from “release fatigue” this year – every month there are amazing new monsters, massed ranks and masters to drool over, and I’m in the same boat. I can’t help myself. This all sounds like a bit of a Toble-moan (it’s like biting into a delicious bar of Toblerone chocolate and whining that the tasty triangly points hurt the roof of your mouth). I get my pick of great stuff, I’m in a comfortable enough place financially that I’m not prohibited from investing in my armies, and yet, I’m now having a whinge about the amount of choice I have. The nerve! Well, that’s not what I’m doing. I’ve also stated before that I believe we’re living in a golden age of sculpts. Games Workshop, admittedly driven in part by the quality work from the other smaller fish in the pond, are making great things happen. When/If Forge World release a Gargant, we’ll pretty much be playing with all the minis that 15 years ago, people wouldn’t have imagined could exist outside of epic scale (enormous titans not withstanding). That is cool (for a given value of the term of course) and I love it. This is about me (what ego!) and my own inability to stop my eyes from wandering onto factions that I have no business thinking about. When I was a kid playing in 2nd Ed, I bought whatever I could afford every other week and I ended up with loads of models and barely an army to call my own. I never want to get back into that habit. It’s really important for me to keep an eye on my project goals. I have my Mortifactors to finish, some Nurgle Daemons to paint up, and a Slaaneshi Warhost to put together. 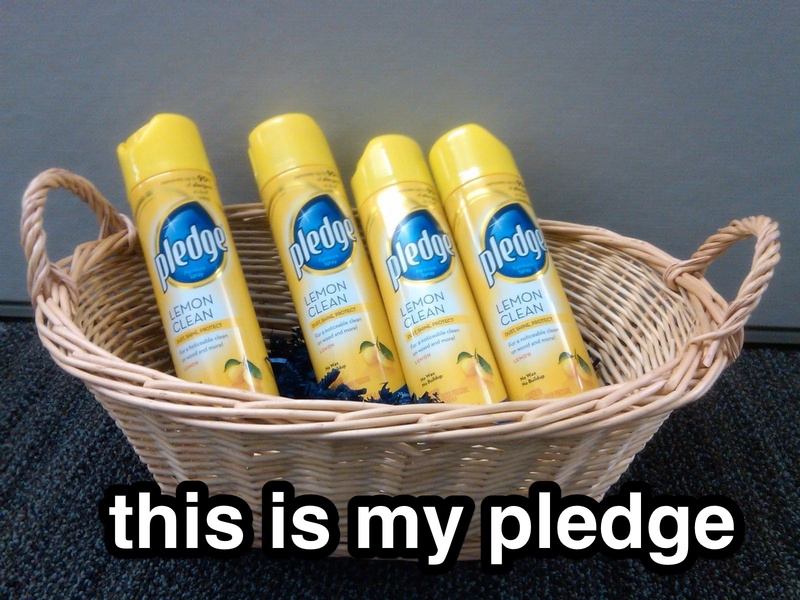 That’s me for the year. And you can hold me to that. That’s what this post was about! I knew it had a point. Yes, my declaration to you, my occasional but delightful readers is this; I shall be working solely on those projects for the rest of the year (oh, and one last bit of Orky commission). So expect more Mortifactors, more gribbly Nurgle Daemons and a few Psycho-delic Emperor’s Children before 2014 expires. And though I’ll almost certainly buy the Limited Edition box set, it will be more for investment purposes than for the hobby. But who knows what 2015 will bring…?